Win tickets to our sold out show at the West Yorkshire Playhouse! Dressed in Time has sold out! But we're giving you the chance to win one of two pairs of tickets to this exciting event on Saturday 18th November 2017. To be in with a chance of winning, email us at company.archive@marksandspencer.com, putting 'Tickets' in the subject line. We'll pick two winners at random, and each will win a pair of tickets to the event. Closing date is midday on Tuesday 14th November 2017, winners will be notified by 5pm the same day. Dressed in Time sees our story come to life at the West Yorkshire Playhouse as characters from M&S's past return to tell their stories. 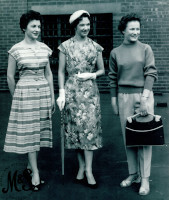 With vintage fashion and music, you’ll discover over 130 years of M&S history. The show starts at 2pm, and the audience is invited to stay for tea and cake after the performance.